Police vehicles block North street Langley Mill. Police and firefighters are currently treating the building blaze in Langley Mill in which three people died as unexplained. Officers were called to the blaze on North Street, Langley Mill, at 4.04am, today, Sunday, June 21, following reports of a fire. Derbyshire Constabulary confirmed a man, a woman, and a female infant had died following the fire which badly damaged the property and a car parked outside. A police spokesman said: “Investigating officers say they are keeping an open mind as to the cause of the fire and have not ruled anything out at this early stage in the inquiry. Several neighbouring properties were evacuated as the fire caused a gas leak. A leading figure in the East Midlands Ambulance Service has expressed his and the organisation’s condolences after the deaths. The fire is reported to have happened at a block of flats where a man, a woman and a baby girl have been reported to have died. Joe Garcia, EMAS Associate Director of Operations, said: “We responded to a very tragic incident during the early hours of this morning where two adults and an infant died. “Our crews were sent to Langley Mill after Derbyshire Fire and Rescue Service called for our assistance at around 4am. “Three ambulances, a paramedic team leader and our Hazardous Area Response Team were sent to the emergency and provided medical support to five patients for smoke inhalation. “Four patients were taken to the Queen’s Medical Centre and one patient to Royal Derby Hospital. 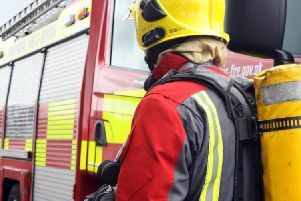 Fire crews from Heanor, Ilkeston, Eastwood and Ripley were called out to the incident with a high-rise ladder from Ascot Drive station, in Derby. Police and the fire service have launched an investigation to establish the cause of the fire. Neighbours reported desperate attempts to rescue the casualties from the three-story building. A police spokesman said several neighbouring properties had to be evacuated as the fire also caused a gas leak. Police and the fire service have launched a joint investigation to establish the cause of the fire.